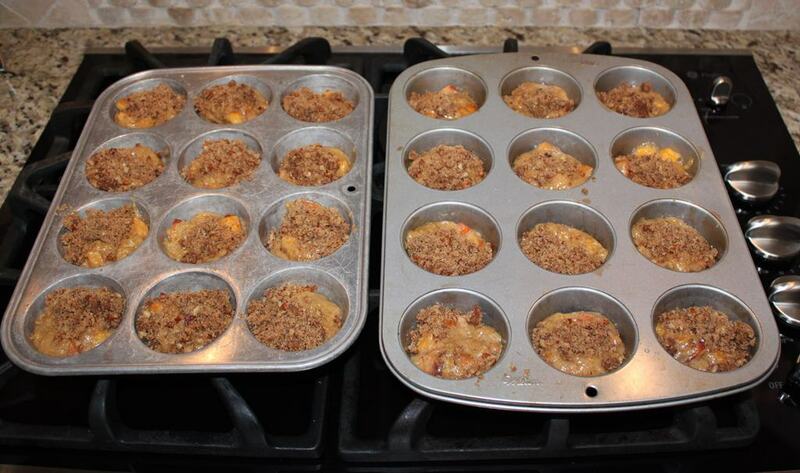 Peach pecan muffins are sweet peach muffins with a nutty crunch from pecans. 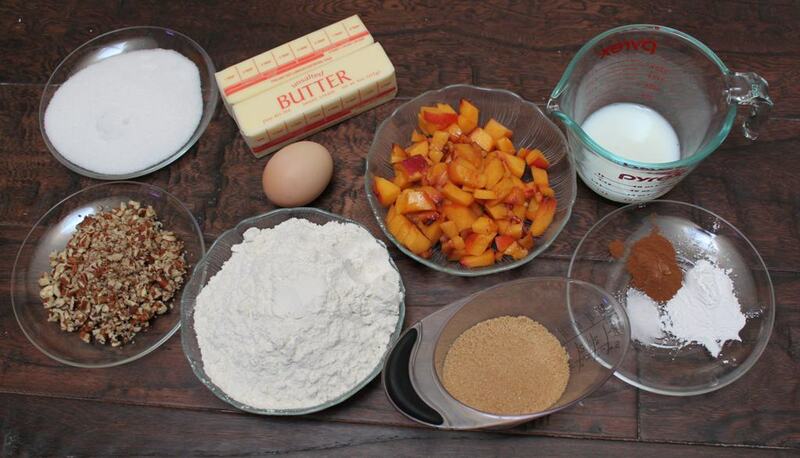 This easy peach muffins recipe is perfect for breakfast, a snack, or dessert. I’ve been a little busy lately updating my MyRecipes account of saved recipes. I love it because one of my favorite magazines, Southern Living, has all their recipes in the MyRecipes database, so I can read the magazine (and get lots of other home decorating, entertaining, and travel ideas), save my recipes into my virtual inbox, and then pass the magazine along to a friend. 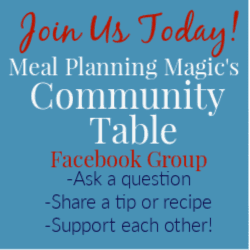 They have SO many recipes there, I love that I can create a custom cookbook of sorts. So when it came to this month’s Eating the Alphabet Challenge, I turned to MyRecipes for some recipe inspiration. 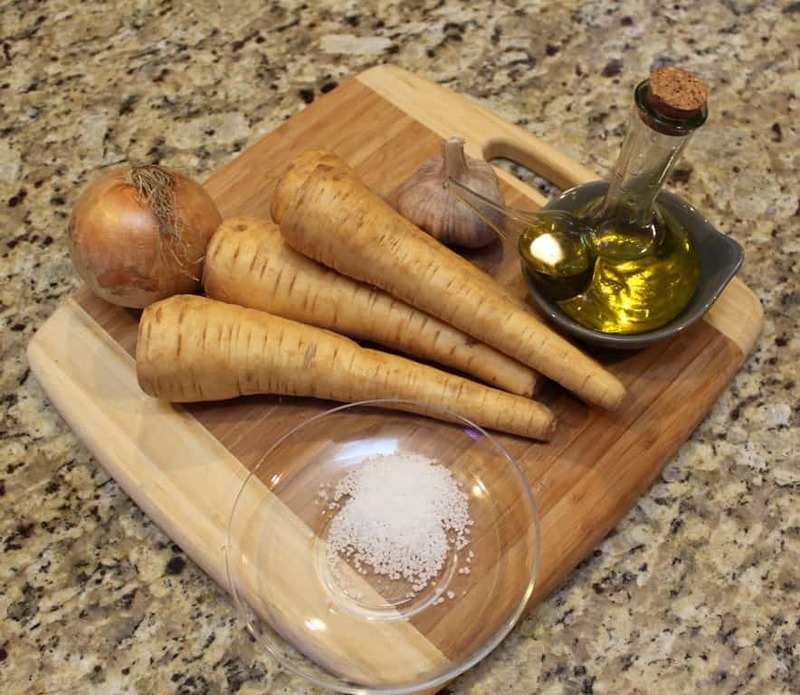 For months, I knew I wanted to try making parsnips. I had never eaten them, much less made anything using them. But after a friend told me last year that she made mashed parsnips AND that her whole family likes them, (four boys and her husband!) 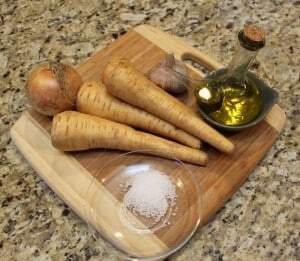 I knew parsnips were what I wanted to make when P came around. Well, unfortunately I didn’t have such great success cooking parsnips. I chose to roast ours, since we love roasted vegetables so much these days. I don’t know what the deal was, but after nearly 40 minutes of roasting, they just never got tender. I was bummed. My first pick: roasted parsnips. Didn’t turn out so well. Look at all these foods I had on hand that start with the letter P! Coincidence? I’m not sure! So I went to Plan B and that was to choose one of the many P fruits I had on hand. Yes, I had pears, plums, pluots, peaches and even canned pumpkin (which I love to have just about any time of year). I even had some pecans on hand! Frankly, there are so many wonderful options that start with the letters P, Q & R, it was hard to choose! 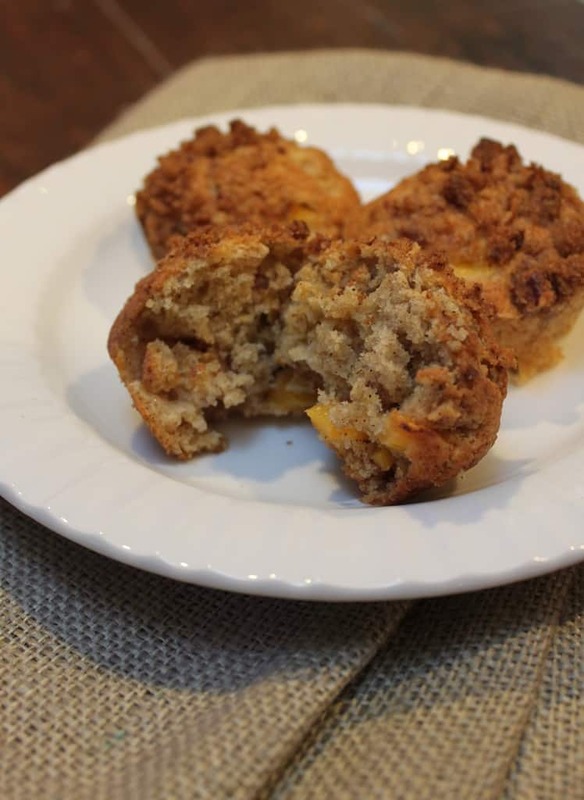 I do love cooking with pears, like these Pear Walnut Power Muffins but this time, I decided to do something with peaches. Mine were getting pretty ripe, so it was perfect. The recipe actually calls for frozen peaches, so you can have these muffins any time of year! Peaches are rich in Vitamin A and a good source of dietary fiber. 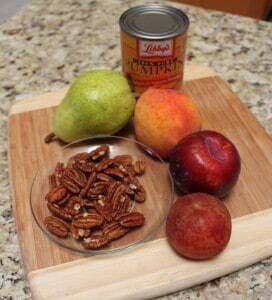 I wanted to use pecans too, so after a quick search online, I found the recipe for Peach Pecan Muffins. Pecans are a great source of lots of antioxidants including Vitamin E and they are also low in sodium. Now, let me tell you, these peach pecan muffins are not low-cal. There’s a fair amount of butter and sugar in these, but they sure are delicious. The streusel made probably three times as much as I needed, so I put the leftover in a container to store in the freezer for another time. I’ve left the muffins recipe as is, so keep that in mind. I’m hoping to modify the recipe at some point to make them a little healthier—using less butter and maybe whole wheat flour. Until then, think of these as a treat and if you’re serving them for breakfast or brunch, pair them with a good protein and variety of fresh fruits. All the muffin ingredients ready to go! All ready for baking! I didn’t use much of the struesel (although it was still plenty!) so had a lot leftover. With a subtle peach flavor, we all love the peach pecan muffins, and they freeze well too. Prepare Streusel: Stir together pecans and next 4 ingredients until crumbly. Prepare Muffins: Preheat oven to 400º. Combine flour and next 4 ingredients in a large bowl; make a well in center of mixture. Stir together butter, milk, and egg; add to dry ingredients, stirring just until moistened. Gently stir in peaches. Place paper baking cups in 1 (12-cup) muffin pan, and coat with cooking spray; spoon batter into cups, filling two-thirds full. Sprinkle with Pecan Streusel. Bake at 400º for 20 to 25 minutes or until a wooden pick inserted in center comes out clean. Cool in pan on a wire rack 10 minutes; remove from pan, and serve warm or at room temperature. « Where has Meal Plan Mom Been Lately? What a bummer that the roasted parsnips didn’t work out for you. I have roasted them before, then pureed them into a soup. Great for fall. Maybe your chunks were too large? They are a very firm veggie, so small pieces work best. I encourage you to try again sometime. They have a great flavor. But your muffins look delicious too. Definitely can’t go wrong with peaches! ooh yes. I make all my food for my son! His fave’s seem to be broccoli, beets, cartors and cantalope! (but he also enjoys eating a turnip/rootabaga blend, peaches/spinach blend, eggplant, and yams! He doesn’t seem to care for the texture of green beans! haha) I loove knowing exactly what he’s eating, and that it’s not a bunch of sugary food.